This post is part 2 of our investigation into Mark Whitfield’s jazz guitar solo from The Blues, from Way Back. In this video lesson you’re going to learn 4 cool-sounding jazz blues guitar licks from Whitfield’s recording, so you can solo over a jazz blues like a pro. 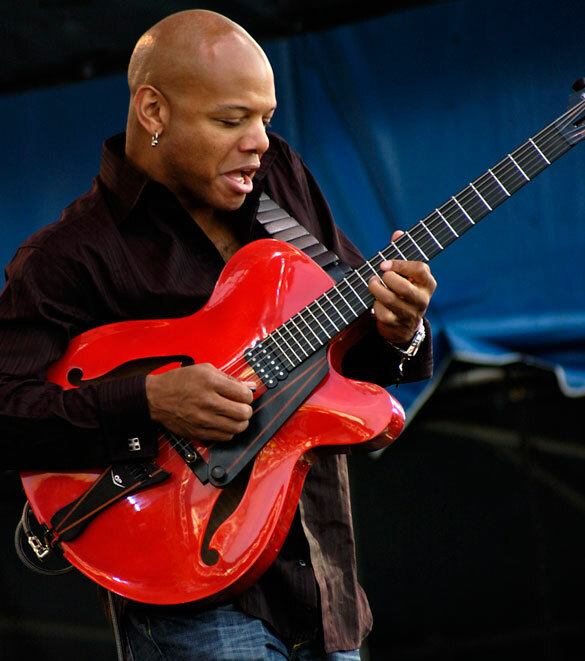 Mark Whitfield is one of the most highly acclaimed jazz guitarists alive today. In 1990 the New York Times dubbed Whitfield “The Best Young Guitarist in the Business”. Later that year, Warner Bros. released his debut album The Marksman, and The Blues From Way Back is a track off this landmark recording. Check out a demonstration video of the 4 jazz blues guitar licks from The Blues, from Way Back below. Then, read on for explanations on how they work and tips to get the most out of them in the woodshed. 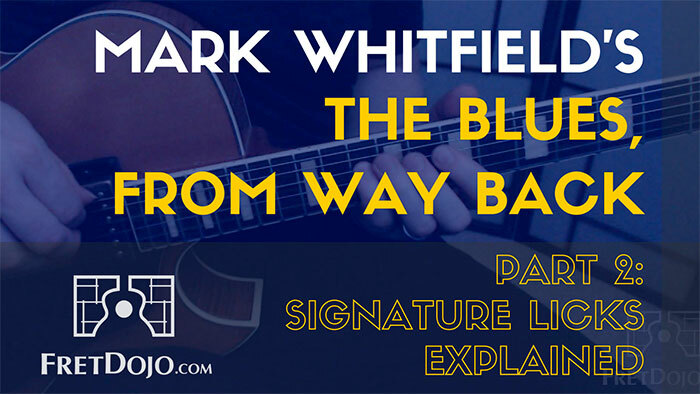 Cool Bonus: Get access to a FREE print friendly PDF version of The Blues, from Way Back licks by Mark Whitfield, complete with notation, TAB and analysis. Hint: Fast forward the video to the time code (in green) to get to the spot in the lesson that demonstrates each step below. You can’t get much more bluesy than this lick. This one kicks off with a slide into the 6th of the chord, which is followed by the root – giving it that tasty major blues sound. This is followed by one of the most important elements of jazz blues vocabulary – the slide from b3 (the ‘blues note’ in a major blues scale) to 3. The final part of this jazz blues guitar lick outlines the C7 chord of the harmony. However, note that this lick sounds pretty cool over nearly all the changes of a jazz blues without transposition – meaning you can treat every chord in the blues progression as C7. You can hear me doing this when I play this lick along with the backing track in the video above. So, experiment playing this lick over different chords in a jazz blues progression instead of only on the I7 chord. Whereas the last lick had a major blues sound, lick #2 is distinctly minor blues in its quality. The first run in this lick is easy to understand – it’s based on a minor blues scale (1, b3, 4, b5, 5, b7). Like lick #1, this one finishes on a triplet figure outlining a C7 arpeggio. You can also use this lick on every chord of a blues progression without transposition and it will (usually) sounds great. Notice how the first part of the lick is tense with a double time feel, but the final phrase is a slower rhythm and more relaxed. This is an important concept to bring into your solos – the interplay between tension and relaxation. To give the solo this tension/relaxation interplay, Whitfield mixes traditional blues sounds with sophisticated bebop approaches. The next 2 licks are great examples of jazz bebop vocabulary at its finest. There’s a lot going on in this lick. A chromatic scale begins the line, which then moves to a commonly used bebop pattern. My buddy Matt Warnock from mattwarnockguitar.com calls this bebop pattern a ‘4123 finger pattern’, as that’s the finger pattern it makes on the fretboard if you play the pattern on one string only. Following this, a series of various enclosures highlight key chord tones of the harmony. To get nitpicky – there are 3 different types of enclosures in this lick. The first is a chromatic enclosure (marked Enc) – where you play a note 1 fret above and then and then 1 fret below a target tone. The next is a diatonic enclosure (D.Enc), where you do the same but rather than playing chromatically, you base the enclosure on the diatonic scale pattern of the given harmony. The final enclosure is known as a diatonic chromatic enclosure (D.Ch.Enc), which is a mix of the above 2 enclosure types. In this context, it gives a strong harmonic minor sound to the line, as the C# is the raised 7th of Dm. This lick is the most advanced and can be a bit tricky to get under your fingers, but it’s well worth it. The first bar is full of strong bebop sounds – here we have a 3 to 9 arpeggio followed by a 7b9 sound, and again we see a 4123 bebop finger pattern – the same as what was used in lick #3. Bars 2 and 3 have an interesting series of triads outlined: C – Eb – Ab – and Db. Can you guess what’s going on here? These triads are tritone substitutions of a I – VI – ii – V progression in the key of C – namely, C, A7, Dm, and G7. Each of them is substituted for their tritone equivalent. This series of tritone substitutions (i.e. based on a I – VI – ii – V) is known as the ‘Ladybird’ progression – based on the closing chords of the jazz standard of the same name. You could say the harmony is ‘elaborated’ here – instead of a straight C7 chord being outlined, a I – VI – ii- V turnaround is implemented instead to create more movement in the harmony. The harmony is anticipated from the next bar. Here, Whitfield is essentially thinking 1 bar ahead in the harmony. This is a technique used since the days of Charlie Christian to create a feeling of forward motion in a solo. In summary – the harmony is elaborated, tritone substitution is applied to the elaborated harmony, all while anticipating the harmony of the following bar (phew – that was quite a mouthful). Make sure you learn the lick from memory as soon as possible – jazz should almost never be read from a page if you can avoid it. Learn the lick in every octave and in every position on the fretboard (I use the CAGED system to navigate the fretboard). Sing the lick as you play it on the guitar. Play along with a backing track that is playing the chords the lick is based on (these are written above each lick). Experiment with the lick to see if it can still sound good in other situations – e.g. if the lick is a major lick in C Major, does it work over the relative minor (Am), and vice versa? Put on a backing track of a standard chart (e.g. a jazz blues, Autumn Leaves, All The Things You Are, etc), and practice soloing with the lick wherever you can throughout the chart. Play the lick over and over but attempt to vary it slightly. I call this the ‘morphing’ technique. Alter the rhythms, mix up the order of notes, change the length of the lick and so on. These jazz blues guitar licks are great examples of how to get a classic jazz blues sound into your solos. Jazz blues requires a certain level of bebop vocabulary to give it the right jazz flavor, so experiment with these approaches to get that essential mix of tension and relaxation into your playing. 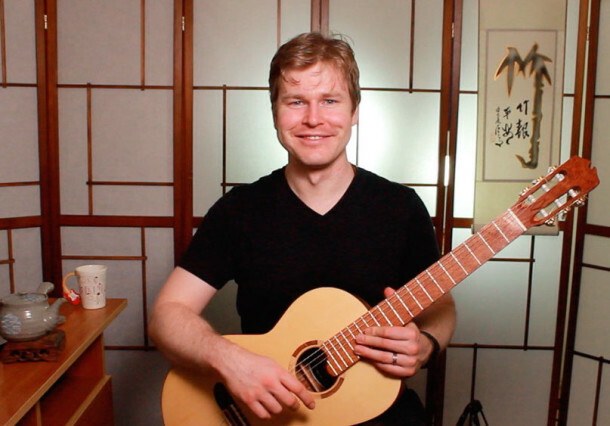 *Stop Press:* In an upcoming post I’ll be interviewing the man himself, Mark Whitfield, who’s going to share the story of his journey with jazz guitar as well as some tips to help aspiring players like you get more results in the woodshed. I look forward to telling you all about it very soon – stay tuned! Special thanks to Mark Whitfield for giving me permission to publish these excerpts on my website. Another great lesson – as always. Terrific licks, and your breakdown and analysis of them are very instructive. Truly enjoying your website. Thanks Greg! Much appreciated. Thanks very much for your kind feedback Rich!